Fred was diagnosed with early onset Alzheimer’s almost three years ago. Two weeks ago he suffered a major neurological “event”. He had what appeared to me as a layperson to be a stroke or seizure, bit the living daylights out of his tongue, slid to the floor and cracked his sacrum. He was hospitalized for five days then began a stay of 20 days in a skilled memory care nursing facility, as covered by Medicare. His release date is October 18th. After that he is all mine. No more help from Medicare other than physical therapy. Fred played on a handful of great albums, including Caveman Shoestore, Curlew, Hughscore, Pigpen and more. The Quietus reviews a new album from David Grubbs. The Chicago Reader covers the reissues of Ornette Coleman‘s Ornette at 12 and Crisis. Vice.com reviews Coil‘s Time Machines, which is out for reissue. Charles Atlas’ very weird Put Blood in the Music from 1989 is on Youtube with a rare interview of a young John Zorn, as well as coverage of Sonic Youth. Earlier this week we added Lina Allemano’s two new recordings to our picks of the week, and reviewed one of them (the other review is coming, promise!). Also on Youtube is an interview with her from last year which provides insight into the life of a modern non-mainstream musician. Fred Frith / Lotte Anker / Samuel Duhsler! Borderlands Trio: Kris Davis / Stephan Crump / Eric McPherson! Scott DuBois QT: Gebhard Ullmann / Thomas Morgan / Kresten Osgood String & Woodwind Quartets! Scott Robinson/Sun Ra Tribute: Marshall Allen / Frank Lacy/ JD Parran! Gunter Hampel Quartett! Heath Watts & Blue Armstrong! Plus Archival Discs from: John Surman Rainbow! Lindsay Cooper! Two from Tubby Hayes! Teddy Charles & Shelly Manne 4 CD Sets! The Residents & Renaldo and the Loaf! Asmus Tiechens! Laaraji! Merzbow rarity! And More..! ROBERTO OTTAVIANO – Rare Solo Sax Set has been Canceled due to Visa problems!?! 7pm: LUIS CONDE from Buenos Aires & JOSH SINTON from NYC – International Multi-Reeds Duo! 7pm: GIACOMO MEREGA / ANDREW SMILEY / ELI ASHER – Electric Bass / Guitar / Trumpet! 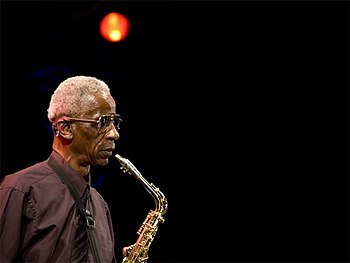 The inaugural edition features an interview with legendary saxophonist and composer Roscoe Mitchell. Mitchell co-founded both the AACM and the Art Ensemble of Chicago, and has been one of jazz’s most forward-looking and inspiring figures since the 1960s. His latest album, Discussions, features large-ensemble interpretations of music originally improvised by a trio featuring Mitchell himself, Craig Taborn on keyboards, and Kikanju Baku on percussion. About a week after this interview was recorded, Mitchell led a new incarnation of the Art Ensemble of Chicago in their first New York performance since 2004. The group featured Hugh Ragin on trumpet, Tomeka Reid on cello, Jaribu Shahid and Junius Paul on basses, and Famoudou Don Moye on drums, and former AEOC member Joseph Jarman made a special appearance, reading his poetry accompanied by the others. In 1964, trumpeter Bill Dixon organized the October Revolution in Jazz, a four-day festival at New York’s Cellar Café intended to showcase the leading edge of free jazz and improvised music. Headliners included Cecil Taylor, Sun Ra and Paul Bley. Out of the public and private discussions at the festival ultimately grew the Jazz Composers Guild, a musician’s cooperative intended to bolster the negotiating power of avant-garde artists. Over the course of four days in early October, Philadelphia played host to the October Revolution of Jazz & Contemporary Music, which carried the aesthetic torch of its namesake festival while showcasing the ways in which the business of and attitudes toward the music have changed in the intervening decades.